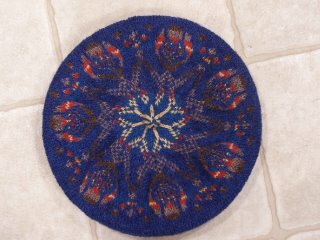 The Acorn Tam from “Sweaters from Camp” is done, not blocked yet but done. I only had two tails to sew in when done instead of the tangled mess I would have had before learning spit splice. Very glad I tried a small project before tackling either a vest or a sweater. I did not get the 32 stitches = 4" on size 2 that I had hoped for. I get about 29 stitches. To knit tighter is going to be hard on my hands so I think I'll be adjusting what size vest/sweater I make rather than try for size 1. I’ve done two color knitting before but never using the two hand throw/pick technique. It is SO much easier on the hands and so much nicer not to have to untangle the balls of yarn all the time. Meg’s lessons in the front of the book are worth the price of the book. 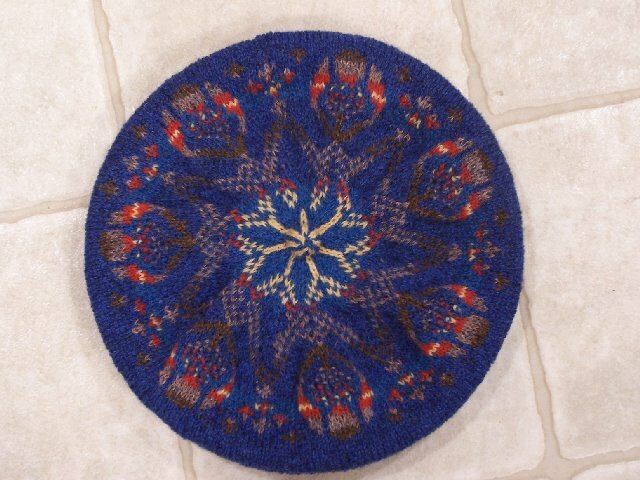 The tam was done in Jamieson and Smith yarn from Water Street Yarns in Hallowell, Maine. I barely broke into the second skein of the blue and the other five colors were maybe 50 yards each. I still have to wash and block it before wearing but it was a fun project. There is an error in one of the arms of the top spiral but I only saw it when taking the photo! The short yellow row is going to stay as I sewed in a button on the top to "make" the acorn and those ends would be impossible to undo. Been raining hard all day so just stayed home by the fireplace and read and knit. I'm still up in the air over starting the Whirligig Vest or the Celtic Circles. Having just finished a big two color only project, I should do the vest and learn to work with more color. With friend Shirley, we’ve now found three local yarn shops that carry 2 ply Jamieson and Jamieson & Smith so finding color should not be a problem. Your knitting is lovely. I usually get 28 sts+4" in fairisle myself so it's a matter of figuring your sts from your gauge. What you got on the tam just might be your normal gauge in fairisle.